We pulled into the parking lot a few minutes after 10AM. There were still plenty of parking spots open but as I glanced at the growing flipflop crowd already coating themselves in DEET (it was 64 degrees, breezy, with no bugs) I wondered why I was bringing us to such a heavily used trail for our first hike with our new puppy, Echo. I carried an empty kid carrier and with Echo on a leash and Alex by my side we left the parking lot and dipped into the woods. This would be a bit of a training hike for Echo. Just a few minutes up the trail I was able to let Echo off leash and start “releasing” him and calling him back with my stash of smoked turkey treats. Alex already had the hand signals down to accompany “sit”, “stay”, “go play”, and enjoyed helping Echo learn. As we approached the falls I put Echo back on leash due to the amount of people and a few other leashed dogs in the area. We made our way over to a sunny spot on the rocks to watch the swollen water from last nights epic storms. When I mentioned leaving so we could meet up with Mommy for lunch Alex was adamant we do some exploring. I brought us a bit further up the trail away from the crowds so I could let Echo off his leash. Alex wanted to go off trail to explore a muddy little stream. My first reaction was to reel him in so he wouldn’t get muddy from the assured trips and face plants off trail travel would bring this 34 month old, but then I started thinking about this excellent piece by Emma Marris, “Let Kids Run Free in the Woods”, which I found through the Expect Adventure blog. I wanted Alex to love hiking. If I always keep him from running, scrambling, exploring, and jumping in every puddle would he really want to keep doing it as he gets older? So I let Alex off the proverbial leash and off he went into the woods. I was proud to see face height vegetation didn’t creep him out like it did this Spring when we were hiking at Tin Mountain Conservation Center. He scrambled over mossy boulders, found some ankle deep mud to jump in, and explored for almost 30 minutes. At one point he told me to stop following him, so I pulled back to about 40 feet from him. He wandered in circles for another 10 minutes humming and playing. This independent nature play was so great to watch. After almost an hour he looked up and when he didn’t see me right away he said “Daddy”? “Yes, Alex?” as I stepped into view. “I like hiking” he said. This tree is BIG daddy! Alex decided it would be fun to run back, and he pretty much ran the entire .6 miles back to the car. He would run for a minute or two, take a quick breather, then run again. He especially loved when Echo would run right next to him. We passed quite a few families with kids on their way in. I saw a few parents who were constantly telling their kids (much older than Alex) to stop running, stay on the trail, slow down, put that stick down… I could see some of these kids look at Alex with some envy as he blasted down the trail laughing and giggling all the way back to the car. It feels good to be off leash. Alex loves farms, and Michelle & I love history, so it was about time for us to visit the nearby Remick Country Doctor Museum & Farm this past weekend. Walking distance from the idyllic village of Tamworth, NH this is an excellent place to spend a half-day with a toddler! We could feel the history in well preserved rooms as we read interpretative information and marveled at what life must have been like in the 1800’s. My favorite room was the dining area, and while researching this post I discovered that they run a few “Hearthside” dinners every year. Next one is October 4th, perhaps Michelle & I will find a sitter! Once we had soaked up as much info as we could inside we headed out to explore the grounds. What kid doesn’t want to sit on this? iPhone Panaroma… great view of Chocurua from here. After visiting the historic barn & milking house our stomachs were growling so we headed down to the village and discovered the tres hip “Tamworth Lyceum“. This was the perfect place to grab some sandwiches after spending the morning on the farm. Best grilled cheese I have ever had, and some great chicken & pesto panini’s were enjoyed on their back porch. While driving home Michelle and I talked about how great it is to live so close to so many great little villages worth spending a day with Alex at. There’s a lot more to Tamworth than I had thought and we’ll be heading back there soon for the River Walk and some of the cool village events. A trip to the Barnstormers Theater is also high on the bucket list, stay tuned! Our beloved Bear passed away just after Alex turned 1. We have always wanted a dog in our family but our hearts were not ready and it was easy to focus our attention on our wonderful one-year-old. This winter we decided that after the busy guiding season we would start looking, and last week, after hearing of a influx of puppies at the Conway Area Humane Society, we decided to get serious. We originally had our eye on a beautiful one year old Shepard mix named Sissy, but after our 2nd visit we were drawn to this 2.5 month old hound mix. He seemed so sweet and gentle compared to his feisty sister. It didn’t take us long to fall in love. Already good on a leash? Once we got home though we started noticing we had upset Alex’s balance in his world… Suddenly it wasn’t 100% about him. And Echo would obviously be trying to figure out where in our pack he belonged. This would be by testing each of us through nips and rough play. It was crushing to hear Alex say “I don’t want a doggy” after being jumped on for the 3rd time. 1) Set up some dog free/kid free boundaries. We want Alex & Echo to become best friends, but that can’t be forced. Some playtime together is important so they grow affection for each other, but so is personal space. Alex no longer felt safe playing with his toys on the living room floor, so I took our wood stove kid gate down and re-installed it to split the living room and dining room. 2) 1 on 1 time, for both Pup and Boy. Michelle and I have been sure to spend some quality time with both Alex & Echo when it is just us. This time is so precious. Like when I took Alex for a swim at our nearby beach, just the two of us. Or Echo sitting in my lap last night at a backyard campfire while Alex read books with Mommy inside. We try to give each an hour of undivided attention every day. 3) Together time. This is very closely supervised at this point until Echo learns he can’t jump on Alex. But with Echo in my lap Alex can sit and learn how to pet him gently. Alex also loves to help get the doggy food and water and sharing these responsibilities will help them bond. Well it has only been 9 days since we brought Echo home, and I feel we are making good progress inducting him into our little family. Thanks to crate training house-breaking has gone pretty well considering his young age, and I feel we are on the right path to establishing the proper “pack order”. Anyone have any tips that worked for them when adding a puppy to a toddler home? Please share below! ‘Leave No Trace’ can wait. For now, throw rocks, pick flowers, be wild. I recently read an article by Emma Marris that makes a wonderfully commonsense argument: kids who play outdoors on their own terms develop a deeper connection to nature. 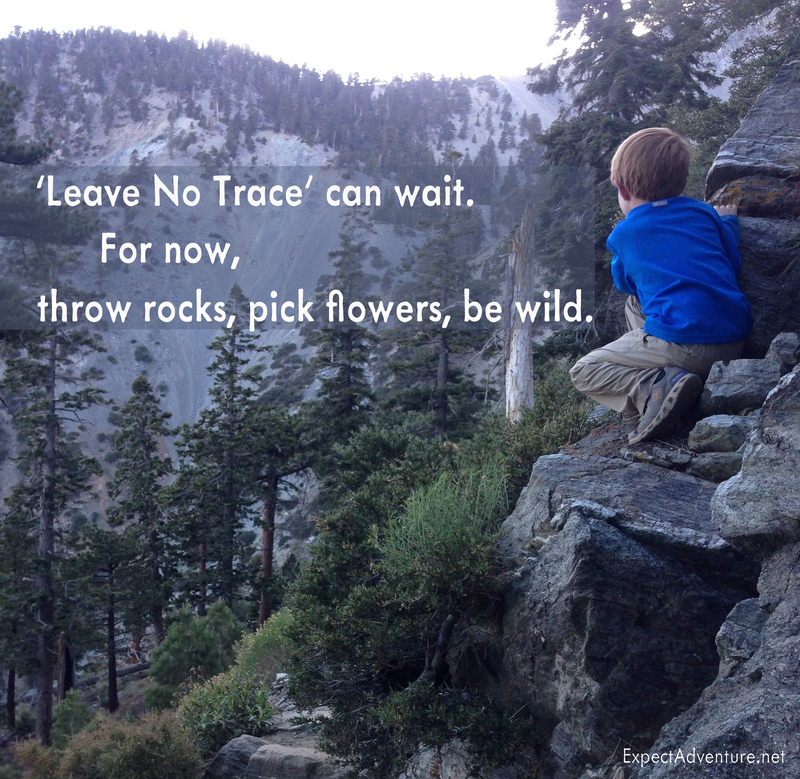 She cites solid research suggesting that Leave No Trace philosophies are only appropriate for adults, but kids should be allowed to run a bit wild – even if they will pick some forbidden flowers. I posted the article to facebook and twitter, where lots of people appreciated this refreshingly relaxed point of view. Meanwhile, I congratulated myself for already encouraging this sort of deep, playful connection to nature. This place is only 2 miles from our home. How have I not checked this place out already!? Alex and I started at the Nature Learning Center off of Bald Hill Rd in Albany, NH. This beautiful eco-friendly building boosts a Nature Library, an impressive collection of preserved mammals (Alex likes the bear that greets you at the door and a large bobcat further in), and a large function room used for educational programs and events. There are about 5 miles of trails on the 138 acre protected land, and they are broken into shorter loop hikes and trails with easy to follow color coded animal trail markers. This made the “find the next blaze” game I play with Alex all the more entertaining. I had a couple of hours and wanted to get as much in as possible so decided to do an “outer-loop” run counter-clockwise around the map. We cruised south along the “Yellow Beaver” trail before descending down and turning right onto the blue “Bear Tree Loop” trail. We turned east and followed it all the way to the Quarry. Alex demanded I carry us up to the top of a tall stack of quarried blocks, which I was happy to oblige. Here there was a distinct lack of trail markers on an otherwise heavily marked trail. After some snooping I decided to follow the obvious boundary line north and came back into the network on that little unmarked trail about 500 feet north of the Quarry. I could see looking back south the Blue Bear trail would be easier to follow if going clock-wise. We soon turned right on the yellow “Quarry Trail”. Alex really liked the pick-axe on each marker though I could not convince him it was not a shovel. I intended to stay on this trail until getting to the orange “Frog Leap Loop” but when Alex saw trail signs with sandwiches on them, the aptly named “Lunch Rock Trail” he was adamant we change course. Giving up my goal of a circumnavigation of the area we headed up the Lunch Rock Trail and decided to break at the open Lunch Rock area for a snack and a leg stretch. After a diaper change Alex wanted to hike a bit on his own. The trail ahead had just a bit too much underbrush for his comfort though so I loaded him back into the pack with a promise he could explore once we reached some more open terrain. Finishing the short Lunch Rock Trail we turned right on the red “Maple Leaf Loop” and made our way towards the 4 acre Chase Pond. Soon after turning onto the orange “Frog Leap Loop” we saw the pond through the trees and came across an impressive beaver dam at its outlet. We crossed the outlet just downstream over a small wooden bridge and turned right onto the blue “Owl Prowl” trail. Soon we had rounded the northern tip of the pond and were turning onto the yellow “Chestnut-Sided” trail to return to the center. We got back to the parking lot 1 hour and 45 minutes from leaving, having completing an exact 2.0 mile loop. Before heading home Alex got to meet a resident dog named Sage (due to her being too smart), as well as the Public Relations Manager Donna and for a brief moment the Executive Director, Michael Kline. I feel very lucky to have such an amazing resource so close to home to help us instill the sense of awe and wonder in nature that we all know is important to a balanced life-style. I’m also hoping to find some ways to be more involved with the organization, through membership and perhaps sharing some educational content like my Wilderness Navigation course I teach through EMS Schools. If you live in the area and haven’t made it over to this place do yourself a favor and make time. It’s a great place with great people and a definite gem for our community! P.S. Adventure With Alex is now on Twitter here and Facebook here! Please follow or share if you like! Another awesome post by fellow blogger Cragmama. If you have rock climbing kids check this one out! Cragmamaâ€™s Featured #KidCrushers â€“ Round 1. I’m also added a list of family/kid adventure blogs I have started following under “Suggested Links”. Please check them out! I may be a little too nonchalant about ticks as I grew up in southern Massachuttes where they are as common as Dunkin Donuts and Red Sox fans. But some things have changed. First, Lyme Disease is becoming more prevalent and spreading. Check out the interactive map from the CDC (Center for Disease Control) here and see how it has spread over 10 years! Ten years ago the White Mountains did not see any cases of Lyme disease, but as the map indicates it has reached us, so it’s time to learn how to protect yourself, and most importantly your little ones, from this disease! Right after taking this picture my wife spotted Alex’s first tick… can you see it? First you should be able to recognize the Blacklegged Tick (also called the deer tick). Most transmissions are from nymph’s because they are harder to see. The good news is it usually takes 24-48 hours of attachment for a tick to transmit the disease! 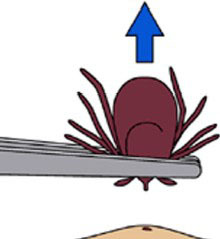 With regular full body checks (bath time/pajama time) you should not panic if you find an attached tick! Tick season in the White Mountains is from May to September. The best defense is a 3 pronged approach. Defend your kids, defend your pets, and defend your yard. Let’s start with the first line of defense, the yard! Clear tall grasses and brush around homes and at the edge of lawns. 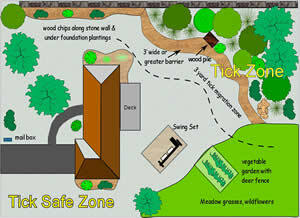 Place a 3-ft wide barrier of wood chips or gravel between lawns and wooded areas and around patios and play equipment. This will restrict tick migration into recreational areas. Mow the lawn frequently and keep leaves raked. Stack wood neatly and in a dry area (discourages rodents that ticks feed on). Keep playground equipment, decks, and patios away from yard edges and trees and place them in a sunny location, if possible. Remove any old furniture, mattresses, or trash from the yard that may give ticks a place to hide. While there are pesticides that are effective at controlling tick populations we prefer the natural battle first. If you live in a very high risk area it might be worth investigating an early Spring treatment with an acaracide (tick pesticide), such as bifenthin. Our canine and feline friends can easily transport ticks from outside to in, so during tick season there are a few things that can reduce the risk. The above yard landscaping is a great first defense. Then a quick brush and check every time your pet comes inside from playing in the yard can find ticks before they find a good hiding space to attach. Tick & flea baths and repellents will go far at reducing risk. For more info on protecting your pets check out this page on the CDC website. Protect your yourself and your little ones! The CDC’s first recommendation is “Avoid wooded and bushy areas with high grass and leaf litter”. This is near impossible for a family that hikes as much as we do. It just isn’t going to happen. So for us early detection is key. Remember it takes 24-48 hours of attachment for a tick to transmit the disease! I check Alex as best as possible when we get back to the car, then again at home. While DEET is approved for babies over 2 months old we feel it is too toxic for us to feel comfortable applying it to our thumb sucking toddler but you can not argue it’s effectiveness. For this reason I use this 30% formula on myself when mosquito’s and tick’s are in abundance. For the absolute best protection I am a huge fan of Permethrin. SAWYER PERMETHRIN INSECT REPELLANT, 24 OZ. I’ve used this in jungles in South America and Asia, and obviously in the White Mountains. It’s 100% safe when used correctly. This is NOT FOR SKIN! It is meant to treat clothing, gear, footwear, etc. Once it dries there is zero chance of this “leeching” into your skin. I use it on my hiking shoes and pants, and Alex’s hiking shoes’s and pants. I also treated our kid carrier so when I set it down on the ground he has protection. For information on the safeness of this product on kids (and us) check out this page from the University of Rhode Island. You can pick it up at your local Eastern Mountain Sports or online here. More information on this, and some other tips from the CDC can be found here. Finally, when you find an embedded tick (and chances are you will at some point), know how to remove it. Improperly removing it can increase risk of infection. All you need is a pair of tweezers. Grasp as close to your skin as possible and pull straight out by slowly increasing pressure. Mistakes like twisting/jerking can cause some of the tick to stay in the skin. If one or both of the “pinchers” stay in do not try to dig them out. Your, or your child’s, body will naturally push them out over a few days but monitor the bite site for any signs of infection, which would require a trip to see the Doc. I would think it would go without saying but do not use a match or lighter on an embedded tick. This can cause it to regurgitate it’s meal, greatly increasing transmission and infection. Once it’s removed wash with soap and water and go back outside to play! I hope this information helps! While Lyme disease is no joke it shouldn’t keep us from hiking and climbing in areas where ticks may be prevalent. 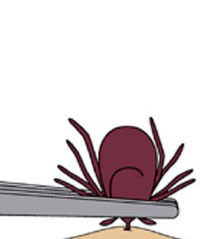 It takes time for a tick to find a spot to embed, and much more time to transmit the disease. Twice daily checks reduces the risk of catching Lyme disease to around the odds of winning PowerBall! Comment below if you have any suggestions or thoughts on the topic! We’d love to hear from you!